Microsoft threw everything and the kitchen sink at the audience during its E3 2018 keynote. It addressed the elephant in the room - the disparity between Xbox and PlayStation in the number of exclusive titles - by announcing the acquisition of five new studios, and Xbox Chief Phil Spencer even teased the fact that Microsoft is thinking about next-gen hardware. By nearly every measurement imaginable, Microsoft had one of the most successful keynotes we’ve seen yet here in Los Angeles. And yet, in spite of the 50 game trailers shown on-stage at the Microsoft Theater that included a new Halo game and Gears of War 5, there was something desperately missing: any mention of virtual reality. It wouldn’t be a big deal if Microsoft hadn’t made VR compatibility a key pillar of the Xbox One X, currently the most powerful console on the market, but when Phil Spencer announced it a few short years ago under the moniker Project Scorpio, VR was mentioned in the same breath as native 4K HDR gaming. Now, it’s nowhere to be heard. In an interview with Xbox’s Corporate Vice President, Mike Ybarra, we finally got the chance to ask exactly what happened in the last two years since the Xbox One X’s unveiling, and what Microsoft has planned for VR on consoles in the future. Ybarra’s answer? In short, it’s just not that easy. When asked for any details about who Microsoft might be talking with to bring VR to its consoles, Ybarra said that he couldn’t comment on that at this time. 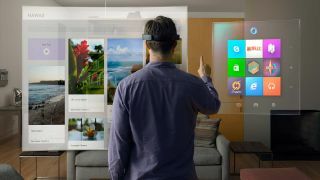 At no point was there an outright no to VR on consoles - but it’s likely that it will still be some time before Microsoft is ready to bring any of its MR devices (or VR devices for that matter) into the living room. Whatever the case may be, don’t expect that VR Halo game anytime soon.